The Jhomolhari trek follows the crystal clear trout rich upstream trail of Para Chu along the verdant rhododendron canopied forests and salubrious green alpine meadows. Mt. Jhomolhari, having one of the most beautiful peaks in the Eastern Himalaya, stands at a magnificent (7314m) with age old frontier forts and sprawling yak pastures in its foreground; a truly rewarding sight for the determined trekker. One the course of the trek, one will have sojourned through several places rich in history in Paro, Thimphu and Punakha. The Jhomolhari Trek is hard and demanding but it is truly rewarding. The trek starts from Drukgyel Dzong, Paro and passes through scattered hamlets and farmland into a deep and richly forested valley, which leads to a high alpine pastureland where yak headers graze their animals. The trek offers a great variety of Bhutanese landscapes. Day 1: Arrive at Paro Airport. You will be received by our guide at the Paro International Airport and escorted to your hotel for refreshment. Evening visit to Paro.Overnight at the hotel. Day 2: Sightseeing to Paro. Morning visit to Ta Dzong. Below is Rinpung Dzong (Paro Dzong), ‘the fortress of the heap of jewels’, built in 1646. In the afternoon, visit Kyichu Lhakhang. Built by the Tibetan king, Songtsen Gampo in the 7th century, it is one of the oldest and most sacred shrines of Bhutan. Overnight at the hotel in Paro. Day 3: Paro – Shana. The trek starts from Drukgyel Dzong (8,500 ft). The trail climbs gently through well maintained rice terraces. Soon the valley widens, and we reach the army post of Gunitsawa (9,200 ft). This is the last stop before Tibet. We continue upwards to just beyond Sharma Zampa (9,500 ft), where there are several good camping places in meadows surrounded by trees. Distance 10.5 miles; Time 5-6 hours. Day 4: Shana – Soi – Thangthangkha. 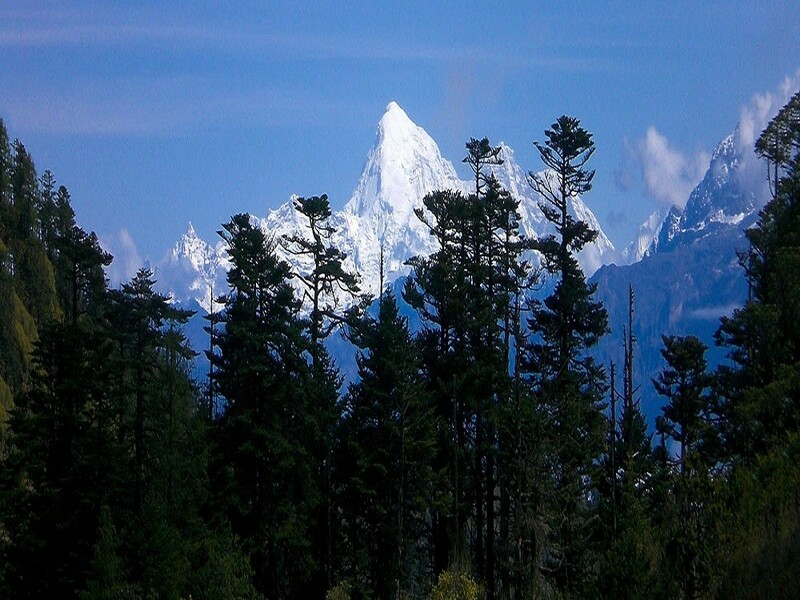 The trail follows the Pa Chu (Paro River), ascending and descending through pine, oak and spruce forests. After crossing a bridge to the left bank of the river, we stop for a hot lunch. Then we continue along the river, climbing upwards through rhododendron forests and crossing the river once more before reaching our campsite. Altitude 12,300 ft; Distance 12.5 miles; Time 7-8 hours. Day 5: Soi Thangthangka – Jangothang. The path ascends until we reach the army camp. We follow the river above the treeline. Hot lunch is served at a yak herder’s camp. A short walk from here into the valley takes us to our campsite at Jangothang. Altitude 13,300 ft; Distance 12 miles; Time 7-8 hours. Day 6: Jangothang – Lingzhi. The trail follows the stream for half an hour. We now start our climb up to the first ridge, enjoying breathtaking views of Jhomolhari, Jitchu Drake and Tserimgang. The trail then takes us across a level valley floor until the climb up to Nyele-la pass (15,400 ft). We descend gradually from the pass to our campsite at Lingzhi, enjoying a panoramic view of the mountain peaks and Lingzhi Dzong as we walk. Altitude 13,100 ft; Distance 11.2 miles; 7-8 hours. Day 7: Lingzhi – Shodu. The Laya-Gasa route leaves the Jhomolhari trek route here. Our trail climbs up towards a small white chorten on a ridge above the camp, then turns south up the deep Mo Chu Valley. 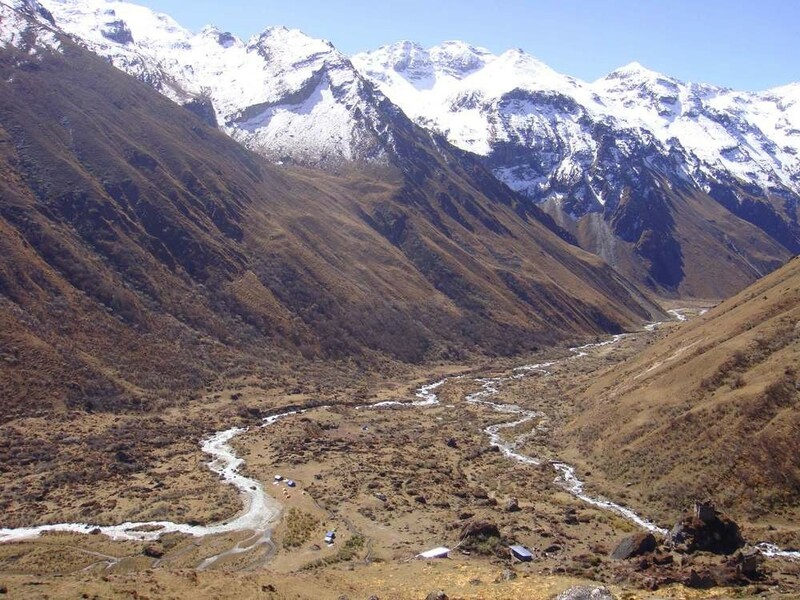 The trail stays on the west side of this largely treeless valley, climbing steadily a short distance above the Mo Chu. It then crosses the river, and climbs steeply for two hours to Yeli-la (15,800 ft). On a clear day you can see Jhomolhari, Gangchenta, Tserimgang and Masagang from this pass. Descend alongside a stream to a rock shelter in the cliff face, and then continue downstream until reaching Shodu (13,500 ft), where we camp in a meadow near a chorten. Altitude 15,800 ft; Distance 13.7 miles; Time 8-9 hours. Day 8: Shodu – Barshong. Back at treeline the path descends through rhododendron, juniper and mixed alpine forests. There are stunning views of rocky cliff faces and waterfalls along the way. We stop at the riverside for a hot lunch. Then the trail takes us gradually upwards to the ruins of Barshong Dzong where we camp for the night. Altitude 11,800 ft; Distance 10 miles; Time 6-7 hours. Day 9: Barshong – Dolam Kencho. The trail descends gently through a dense forest of rhododendron, birch and conifers, then drops steeply. The trail runs along the left bank of the river, climbing over ridges and descending into gullies where side streams run down into the river. The final stage of the trail climbs around a cliff face, coming out onto pastureland where we camp for the night. Altitude 11,800 ft; Distance 9 miles; Time 5-6 hours. Day 10: Dolam Kencho – Dodena – Thimphu. The trail winds in and out of side valleys, making a long ascent through a forest of conifers and high altitude broadleaf species to a pass at 11,500 ft. The trail then drops steeply down to the river, following it southward to the road head at Dodena. Village Tours transport meets us here, and we drive to Thimphu. Overnight at hotel in Thimphu. Distance 5 miles; Time 3 hours. Full day of sightseeing in Thimphu Valley visiting the following, as time permits: National Memorial Chorten; Tashichhodzong (‘the fortress of the glorious religion’); National Library; Institute for Zorig Chusum (Bhutanese arts and crafts school); National Institute of Traditional Medicine ( outside only )Handicrafts Emporium. Evening drive to Paro. Overnight at the hotel in Paro. Day 12: Transfer to Paro airport for final departure. Early morning drive to Paro international airport after breakfast for onward departure.